We have been Showing and breeding German Shepherds for over 30 years and abide by Dogs NSW Code of Ethics & participate in all relevant breed improvement schemes administered by the German Shepherd Dog Council of Australia. Our puppies are obtained from Breed Surveyed & X-Rayed stock. Our puppies are sold at 8 weeks of age being Registered Microchipped Vac's & tattooed. We continue to strive to improve our German Shepherds by using the best stud dogs available and to this end we have imported from Overseas to improve and expand the available gene pool. We have Stud Dogs available & puppies sometimes available. 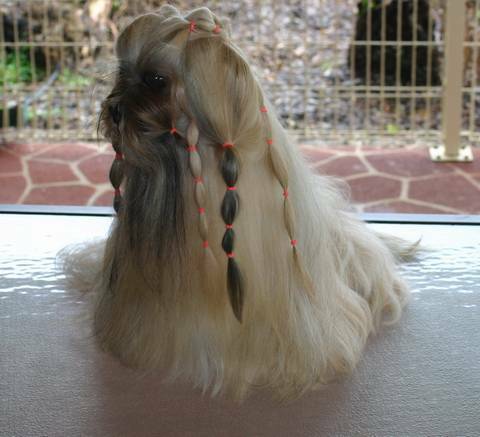 We have been showing Lhasa Apsos for over 30 years and breeding for over 20 years and abide by Dogs NSW Code of Ethics. Our puppies are well adjusted and available at 13 weeks of age after being desexex, Registered, Microchipped and Vac's. We continue to strive to improve our Lhasa Apsos, breeding for exceptional temperament & type. Our lines include imported dogs from both America , England, Swedenand The Netherlands. We continue to look outside our kennel both in Australia and overseas to ensure that the stud dogs we use are of the highest quality to enable us to improve the breed.